Schneider learns that his brother passed away and that somebody needs to take care of his nephew and niece so Schneider gets a phone call to come and pick them up. The place where he arrives is a carnival like place with circus like people. This place needs repairs and some "manly guidance" so everyone tries to persuade Schneider to move there and with Ann gone and the kids grown up, Schneider finally accepts the move. Ann gets a job offer in London and ponders taking it. Despite getting nagged by her mother, she decides to accept the job. This leads her to wonder how she's going to tell the rest of her family that she's leaving. Working side by side at the travel agency spawns a growing attraction between Max and Barbara, that becomes impossible to ignore. Schneider gets a new lease on life after he's accidentally electrocuted, then revived, a hair raising experience in which he claims he died and came back to life. Mark's jokester friends are visiting and taking their jokes too far to the point where everyone gets sick of them. Barbara gets so fed up that she tries to teach them a lesson by "getting hurt." An Italian priest arrives unexpectedly at the Royers, claiming to be a distant relative of Grandma Romano. Ann and Francine's business relationship is threatened when Francine announces she's marrying an ad executive Ann doesn't trust. Barbara loses charge of her household when Grandma Romano moves in with her own set of rules, menus, meal schedules and a collection of cuckoo clocks. Schneider has a sentimental reunion with his high-school love, who pays him a visit on his 50th birthday, bringing along her own cherished memories of their past. Francine goes behind Ann's back to talk Sam into designing an elaborate office suite that's too grandiose for Ann's taste. Julie decides to leave her husband. Sam's late night disappearance has the family convinced he's been kidnapped until Ann learns he's kept his old apartment. Ann has the holiday blues, believing she and Sam will be alone on Christmas, but Sam plans to surprise her with a Caribbean cruise. To arrange a long-overdue vacation, Barbara and Mark visit a travel agency, where Barbara finds an unexpected career opportunity. Barbara, still wanting to have a child, continues to consider adoption. A weekend watching little Annie for Max and Julie has Barbara longing to have her own baby and begins considering the option of adoption. Ann's imagination runs away with her when Sam runs off on a business trip with an associate who happens to be his ex-girlfriend. A plan to collaborate on the writing of children's stories drives Julie and Max into a bitter feud over Max's potential as a writer. The opening of his new dental office gives Mark such a case of the jitters that he may give up his practice before the first patient walks through the door. A visit from Sam's ex-wife sparks a sudden need for attention in Ann, who resents the pampering the former Mrs. Royer recieves from Sam. Sam and Ann are adjusting to married life and find they disagree on monumental issues such as where the spoons should be kept. Ann and Sam's ski honeymoon quickly goes downhill when Ann loses her luggage and Sam injures his back on the ski lift. Sam unilaterally sets a wedding date as Ann learns from his newspaper announcement that she's getting married in three days. But it's Sam who starts getting cold feet. Mark and Max rent a house without consulting their wives. Schneider feels threatened when his lookalike, a top Sicilian designer sweeps Francine off her feet. A weekend outing with a girl from school is more attractive to Alex than the father-son night he agreed to attend at Schneider's lodge. Barbara's newly friend Bob reveals he still has feelings for her. A letter to Ann's mother from her father, mailed the day before he died, is delivered four years later. Approaching his 15th birthday, Alex anticipates his first female encounter. But when he strikes out with the school's "girl most likely to," he makes a play for an older woman. A South Pacific island would be just the ticket for Sam, if only Ann would drop her work, desert the family and join him in paradise. Saving a businessman's life earns Schneider executive status in a job, complete with a secretary, a plush office, a rent-free apartment nearby and very little work to do. Alex's video game fascination has him skipping school and facing punishment from the principal, and may be symptomatic of hidden emotional problems. Grandma Romano returns from a vacation cruise with news that she's marrying the shipboard piano player. Unable to cope with the pandemonium at her house, Ann takes refuge at Sam's place, until he offers her a solution for which she's completely unprepared. With Julie, Max and the new baby also needing a place to live, Ann may be forced to leave her own home to preserve her sanity and her relationship with Sam. Forced out of their rooming house by an explosion, Barbara and Mark impose on Ann for a temporary home until they can find a place of their own. Barbara's decision to enroll in college forces the Royers to live on a shoestring budget with little time for romance. Julie insists on flying to California to have her baby in an underwater birth tank but her labor pains are beginning at her mother's home in Indianapolis. Julie's announcement that her baby will be born underwater may be more than Ann can bear. Barbara's scheme to get her mother and Mark's newly divorced father together at a dinner party gets faster results than she anticipated. Ann may be a little envious of Francine's freewheeling lifestyle, especially after Francine takes Alex for the weekend and shows him the time of his life. To land a new French account, Francine talks Ann into a weekend trip to Paris to learn about the French market. Believing Alex needs a father figure and more male influence, Schneider and his beer-guzzling buddies take him to a female mud-wrestling show. Barbara tries to adapt to life at Mark's rooming house, where her new husband's friends, including a scantily clad woman, breeze in and out without knocking to use the bathroom, or asking to use the closet and community refrigerator. Mark refuses to cancel his golf game and Barbara's worried he won't get to the church on time. Barbara's nerves are on edge as her wedding day approaches and husband-to-be Mark is no help, he's more interested in his golf game than helping with the preparations. Even if you remember 'One Day at a Time,' you probably won't recognize the new version of the series being prepared for Netflix. The reboot of Norman Lear's 70s hit resembles the original in name only. Valerie Bertinelli says her "heart is breaking" over the death of Bonnie Franklin, who played her mother on the classic show "One Day at a Time." One Day at a Time is currently available to watch and stream on CBS. 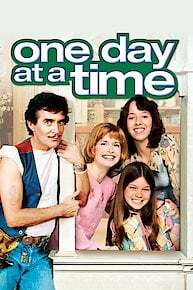 You can also buy, rent One Day at a Time on demand at Amazon, Google Play, iTunes online.